Supporting the Broward Art Guild, simply by shopping on Amazon! 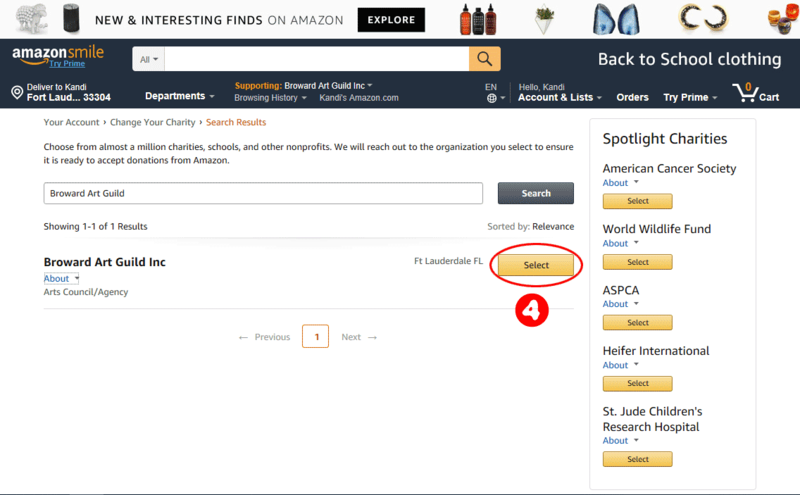 With the Amazon Smile, you can help support the Broward Art Guild by simply shopping on Amazon. The Amazon Smile program donates a portion of qualifying sales to nonprofit oprganizations, and we would love you to choose us! Signing up is easy, and once you register and choose the Broward Art Guild as your selected charity, you just go to smile.amazon.com and shop like normal. It's that easy! 1. 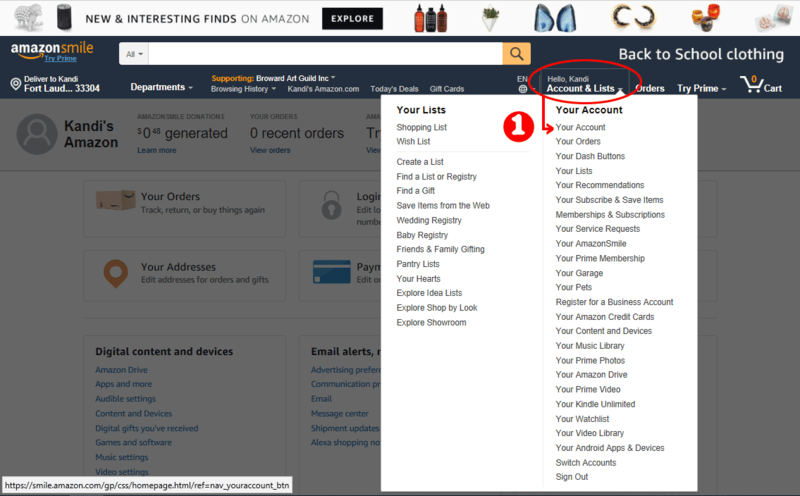 Under your "Account & Lists", go to "Your Account"
2. 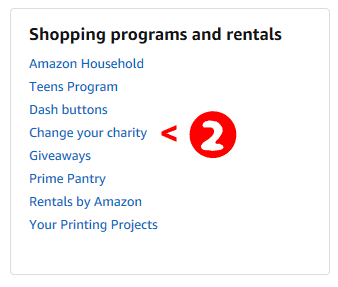 Scroll down to "Shopping programs and rentals"; select "change yyour charity"
3. In the field to pick your charitable organization, enter 'Broward Art Guild", then hit the search button. 4. On the results page, click the "Select button next to "Broward Art Guild Inc.". That's it. 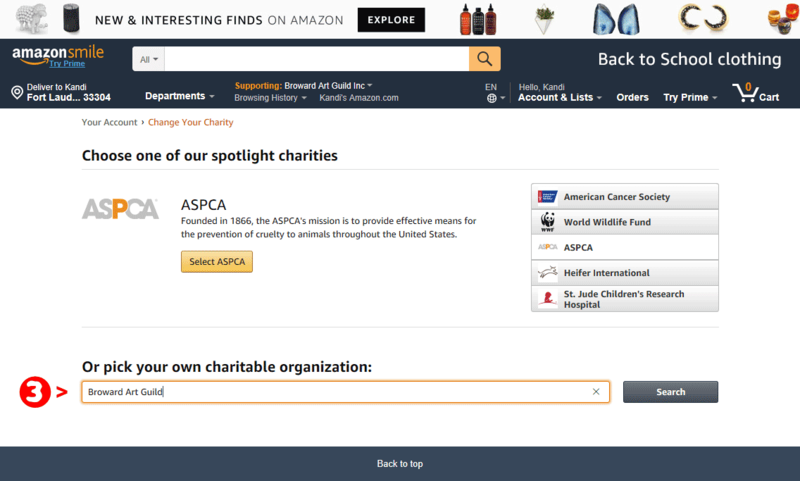 Now each time you shop at amazon, simply go to smile.amazon.com, and all of your eligible shopping will also help benefit us! THE BROWARD ART GUILD IS A 501(C)(3) NON-PROFIT ORGANIZATION. REGISTRATION NUMBER CH17010. A COPY OF THE OFFICIAL REGISTRATION AND FINANCIAL INFORMATION MAY BE OBTAINED FROM THE DIVISION OF CONSUMER SERVICES BY CALLING TOLL-FREE (800-435-7352) WITHIN THE STATE. REGISTRATION DOES NOT IMPLY ENDORSEMENT, APPROVAL, OR RECOMMENDATION BY THE STATE.